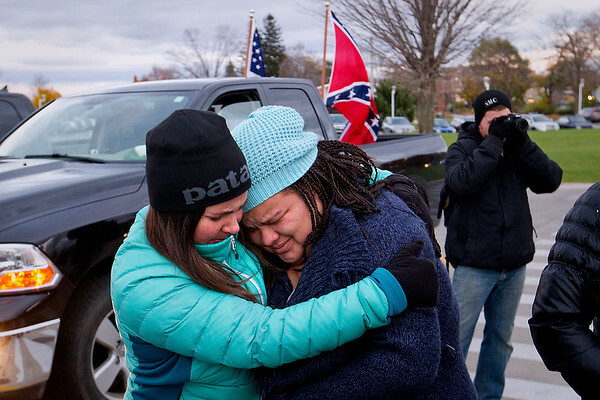 Betsy Coffia, left, hugs Mikela Wilson during the "Love Trumps Hate" rally at the Open Space in Traverse City, which was held in protest of the election of Donald Trump as President, after a group of Trump supporters arrived in a truck flying a Confederate flag. Wilson said the flag hurt after growing up hearing stories of her family membersÕ treatment by racist groups in the south. Several hundred people gathered at the Open Space before marching downtown along Front Street.